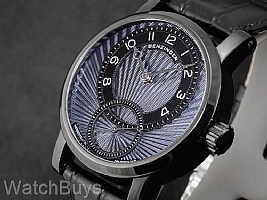 Jochen Benzinger watches do not just catch the eye, they tend to draw a crowd. And although we have quite lofty expectations for Jochen at this point, he continues to exceed them time and time again with his exquisite work. The all new Subscription Black and Blue is no exception, and we were particularly excited to receive this new addition to the Subscription Collection as it is the first subscription to feature an all black PVD / DLC stainless steel case. The rich blue dial on this watch is hand guilloched using machines dating back to the early twentieth century. The dial is finished with a blue Galvano lacquer and guilloched in a unique sunburst pattern completely by hand. The process of making just the dial can take days. The top dial displays white Arabic numerals which provide contrast and visibililty against the black PVD / DLC chapter ring. Next, Jochen adds the sub-seconds dial, which can be found at 6. 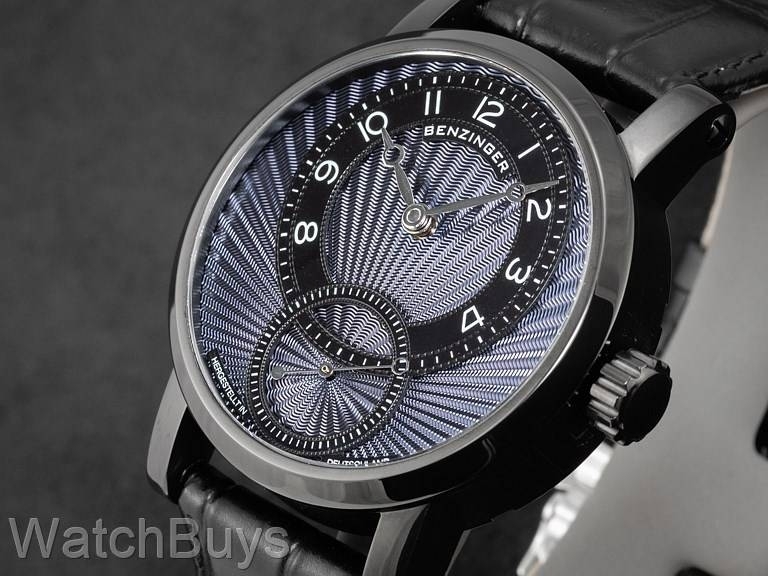 This design element is where the collection of Jochen Benzinger's Subscription watches gets its name, and it is often associated with mechanical movements of the finest design. This design requires that the seconds function be separated from the hour and minute displays, most notably where the hands are off center. This modification to the movement has been completely made in-house. 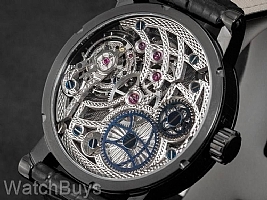 Finally, dial of the new Jochen Benzinger Subscription Black and Blue has not been skeletonized like many of the other pieces in his collection choosing guilloche instead. 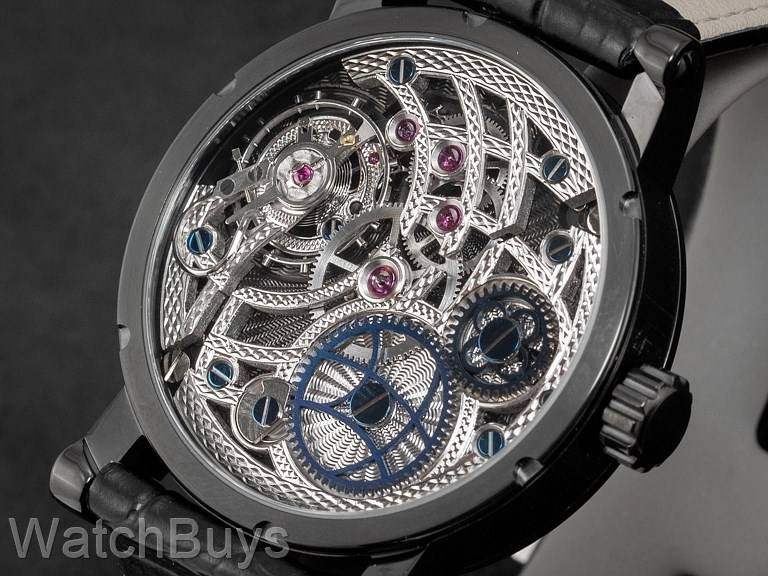 Jochen has focused his talent for skeletonization on the movement, which features a base plate treated in blue platinum. This plate provides an elegant backdrop and great contrast to the hand skeletonized bridges, wheels and gears which are dressed in a silver platinum. Sapphire crystals on both sides. The presentation box is elaborate, and naturally features engraved plates describing and naming the watch. This watch ships with a black Benzinger calf leather strap and deployant buckle.